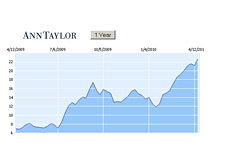 In a Form 13G filing released earlier today, Citadel Advisors LLC revealed that they now own a 5.2% stake in ANN (Ann Taylor Stores). Citadel's 5.2% stake means that they now own 3,054,604 shares of the company. At the end of Q4/09, Citadel reported a 1,035,747 share (long) position in the company. In addition, Citadel reported owning a number of ANN puts and calls. According to the filing, April 9th, 2010 represented the date in which filing the 13G became necessary. A 13G filing is required when an entity (person or company) takes a 5%+ stake in a publicly traded company. A 13G filing also means that this is a "passive stake", meaning that Citadel won't be looking to exert control. For that reason, the 13G filing requires less information than a 13D filing, which is aimed at stakeholders who will be looking to take a more activist role. ANN closed at $22.70 on Thursday afternoon. The stock has dramatically surged over the past 12 months, trading from a low of $6.15 to a high of $23.53. Prior to Citadel's 13G filing earlier today, Adage Capital held the biggest stake in ANN (1,224,899 shares). Note: the Citadel Investment Group is one of the largest hedge fund firms in the world. The company was founded by Kenneth Griffin in 1990, and currently manages billions of dollars in assets.